In 1998, under the direction of Dr. Joseph Li, Beth Israel Deaconess Medical Center (BIDMC) in Boston established one of the nation's first Hospitalist programs. Dr. Li continues to lead the program today, and BIDMC is considered one of the premier academic hospitalist groups in the country. As it’s grown, the BIDMC Hospitalist Program now includes several community hospitals, including Plymouth, Milton and Needham. The Hospitalist program continues to grow at a remarkable rate and our group has more than 90 physicians who see nearly 133,000 patients annually. Beth Israel Deaconess Hospital-Plymouth, the largest community hospital of the BIDMC family of hospitals, provides the most services of any community hospital in the Beth Israel Deaconess network. At BID-Plymouth, our Hospitalists care for the majority of the patients hospitalized in our community, and they care for more than 100 patients per day. Hospitalists are board-certified physicians trained in Internal Medicine or Family Practice who have chosen to focus their practice in the hospital setting and are dedicated to the delivery of comprehensive medical care to hospitalized patients. At BID-Plymouth our Hospitalists have specialized knowledge in managing very ill patients and are able to provide high-quality, evidence-based, efficient patient and family-centered care in the hospital. Hospitalists are responsible for all aspects of patient care--from the moment a patient is admitted to the hospital to discharge. Since Hospitalists spend their entire day working in the hospital, they are able to address changes in patient status and medical concerns throughout the day. Their presence in the hospital 24 hours per day allows them to respond to emergencies promptly. Unlike the old model of hospital health care, in which a primary care physician would visit with hospitalized patients before or after office hours, Hospitalists care for patients throughout the day. The new model of hospital health care was designed to meet the evolving needs of patients in acute care settings. Hospitalist physicians update plans of care, respond to test results and changes in patients’ status throughout the day. Under the new model, primary care doctors are able to spend uninterrupted time focused on medical care of their office patients. Hospitalists notify primary care physicians when their patients are admitted and send discharge summaries to them when their patients are discharged from the hospital. Hospitalists often communicate updates to primary care physicians regarding their hospitalized patients during the course of the hospitalization. The hospitalist covers for your primary care physician while you are in the hospital and manages all aspects of your care until you are discharged from the hospital. Hospitalists do not have an office practice. They spend their entire day working in the hospital and are easily available when you and your family have questions or concerns. After you are discharged, your care transitions back to your primary care physician. As such, most questions after discharge should be directed to your primary care provider. However, if you need to contact a care team member, please call us at 508-830-2000. How can I be sure that my primary care doctor is updated? Upon admission to the hospital, make sure that your current primary care physician is in the electronic medical record. The hospitalist will automatically send admission and discharge information to your doctor. What can I do to be sure that I receive the correct medications? - Always carry an updated medication list. - Check and update that list any time changes are made. - Make sure the list includes the doses and frequency of your medications. - Know why you take each medication. - If you take an unusual/specialized medication, bring that medication with you in the original labeled prescription bottle to present to the hospital staff. - Never take your own medications while you are hospitalized, unless instructed by your hospitalist to do so. - If you have questions about the medications you are receiving, ASK. Having medication information will help your hospitalist order the correct medications. Be aware that medication doses are often adjusted or medications may be held during a hospitalization. How will I know that the Hospitalist has my medical information? When you are hospitalized, the Hospitalist will review all the past medical records available in the electronic medical record and may request further information from your doctor’s office or other hospitals. Will I see more than one Hospitalist during my hospital stay? Hospitalists cover the hospital 24 hours per day. One hospitalist may be involved in admitting you to the hospital, while another may manage your care for a continuous number of days in the hospital. During most hospitalizations you would see up to two hospitalists. During a prolonged hospitalization, more hospitalists would manage your care. Our physicians communicate with each other when a patient’s care transitions from one doctor to another. What are the benefits of Hospitalist care? - Expedited diagnosis and treatment while you are in the hospital. - Improved communication between you, your family and your team of doctors and nurses. - Immediate action if test results are abnormal. - Immediate response if an emergency occurs while you are in the hospital. Hospitalists are also quality and safety leaders that work to reduce the potential hazards of medical care, such as hospital-acquired infections and medication errors. Studies have demonstrated improved clinical outcomes under hospitalist care compared to older models of care. 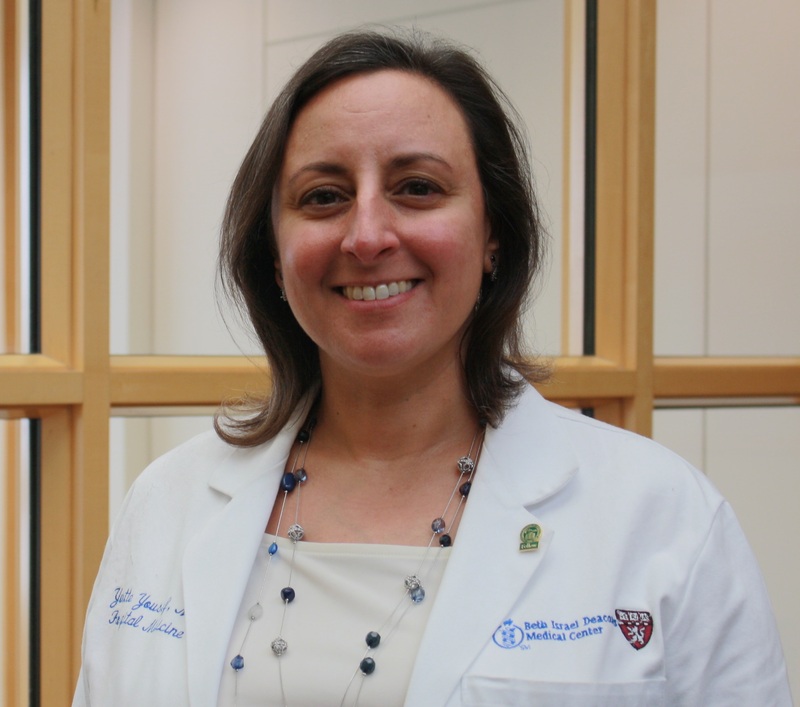 In October of 2017, we welcomed Yvette Youssef, MD, FACP, as Director of the Hospitalist program at BID-Plymouth. Yvette is a South Shore native with 12 years of experience as a hospitalist and an additional nine years of experience as a primary care physician prior to that time. Her hospitalist team strives to provide efficient, cost effective, high quality, compassionate care to our hospitalized patients.